Portable Sanitation Industry Experts – We Guarantee It! We want you to take some time to learn about us. Portable Sanitation Systems, established in 1968, is committed to being the best provider of portable sanitation. This includes the quality of products we offer, the services we provide and the attitude, dedication and skills of our employees. Let’s face it, many people giggle when they talk about portable restrooms. Some think of it as a low-tech, low quality, low expectation business. Portable Sanitation Systems is proud of our service, teamwork, results, and a growing list of satisfied customers. Whether its portable restrooms for the season or special events, construction units, high rise construction units, restroom trailers, hand wash stations, units on wheels or a combination of some or all of the above, we can help you in your planning process by suggesting particular products or services that can help make your event flawless! Please take the time to browse through our website at the different products we offer. Please remember we do everything to assure our customers are completely satisfied with the equipment and services we provide. WE GUARANTEE IT! The Illinois State Fair and several county fairs within central Illinois. Prominent, large-scale special events, such as marathons and cancer walks. Construction projects across Central Illinois, including major power plants, pipelines and railroads. Independent events, parties and weddings. Portable Sanitation Systems guarantees its services and aims to exceed customer expectations. We are a forward-looking company, dedicated to leading the market in portable sanitation provision. Our quality-assurance program includes GPS tracking of our fleet of trucks, a quality control inspector, and a comprehensive cleaning and sanitation process for all of our equipment. PSS continually evaluates the sanitary needs of its customers and works diligently to meet those needs. Our committed team is focused on providing outstanding customer service. Portable Sanitation Systems has state of the art technology and equipment to better serve our customers. 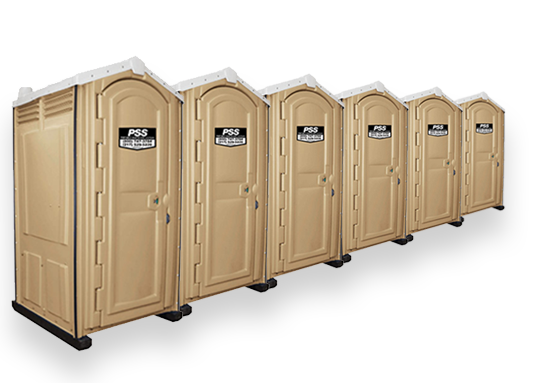 PSS’ equipment, specifically with regard to portable restrooms and restroom trailers, remains unmatched by any competitor in Central Illinois. We have trained sanitation specialists who build, maintain, and service our portable restroom and restroom trailers. PSS maintains its reputation as an active member of the Portable Sanitation Association International (PSAI). PSAI serves as the governing body of the portable sanitation industry.